Chvrches were just one of hundreds of amazing bands that made NXNE 2018 so special. Chvrches headlined NXNE's Yonge Street Festival Village, Saturday June 16 along with Light, Yungblud and many more. Other headliners included: Jazz Cartier, Azealia Banks, Tinashe, Big Freedia, U. S. Girls and many more. NXNE comes roaring back in 2019, our dates are June 7 - 16. We launch Friday, June 7 with a killer party, of course. Our Game Land eSports tournaments will run June 8 and 9, after weeks of on-line quaifying play. NXNE’s Club Land shows start Saturday, June 8 and will run untl June 15 at all top Torornto live music venues — plus a few secret new venues. A $29 wirstband gets you into all the fun, crazy good deal! The NXNE Talks conference is back Wednesday June 12 where we don’t just exlore the How To’s of the Music Industry but the Whys. 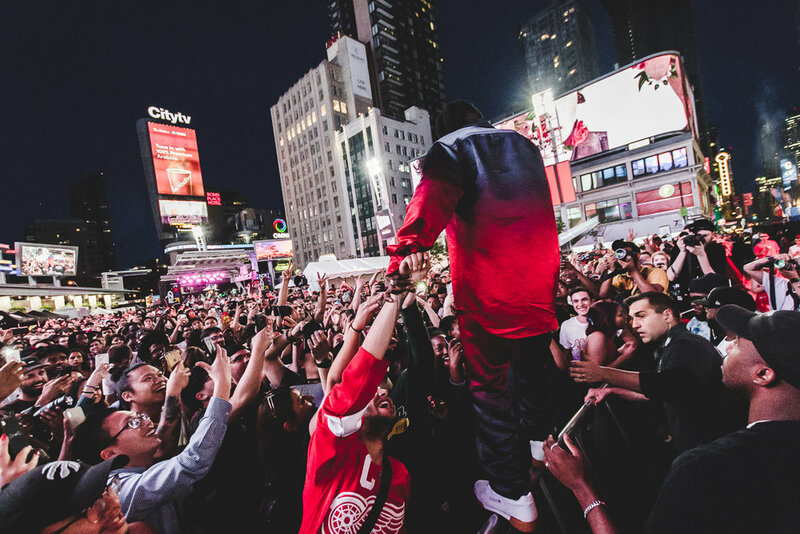 And we’re back on Canada’s biggest Street June 14 - 16 creating NXNE’s Yonge Street Festival Village where we shut down the street and open up the fun for over half-a-kilometer of amazing action from Queen to Dundas. Look for more live music stages and even more action on NXNE Yonge Street 2019. Lots more details coming soon. Over 200,000 people attended NXNE 2018 and we’ll make that number look like a kitchen party in 2019! Lights was just one of the amazing acts that highlighted the NXNE Yonge Street Festival Village. Other great acts included: Chvrches, Big Freedia, Jazz Cartier, Azealia Banks, Yungblud, . U. S. Girls and many more. Jazz Cartier was just one of the amazing acts that played NXNE’s Yonge Street Festival Village in 2018. Look for more amazing acts in 2019. (photo by Ashton Mills, Jazz Cartier guitarist and Kaylee Smoke).